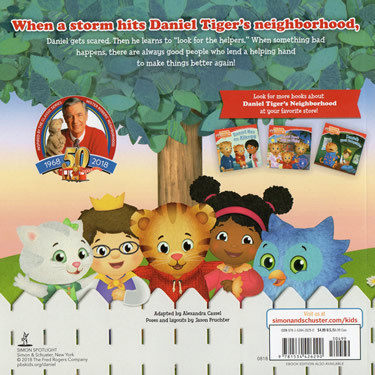 When a storm hits Daniel Tiger's neighborhood, Daniel gets scared. 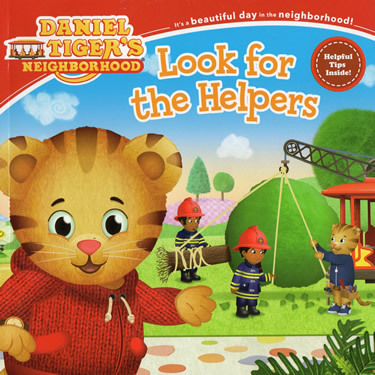 Then he learns to "look for the helpers." When something bad happens, there are always good people who lend a helping hand to make things better again! This book is based on the storyline from Episode 213. This book includes multiple pages of helpful tips for handling emergency situations. 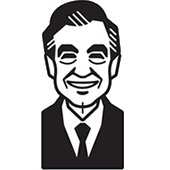 Before the story begins, a page is dedicated to the Fred Rogers quote which inspired the title of this book: "When I was a boy and I would see scary things in the news, my mother would say to me, 'Look for the helpers. You will always find people who are helping. To this day, especially in times of disaster, I remember my mother’s words, and I am always comforted by realizing that there are still so many helpers -- so many caring people in this world."